Put an applique DOT on your make up bag? So much fun with a splash of color. 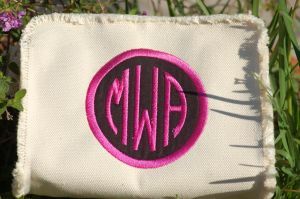 The DOT is stitched on to the bag and then monogrammed. How about your college colors! Wouldn't you love to get this as a gift? 1,2 or 3 initials only and always in a circle. Dimensions: 6"tall x 8"wide x 3" deep.